Grand Cayman is located in the Cayman Islands, the Caribbean Sea to the west or adjacent to Cuba and Jamaica, North America. 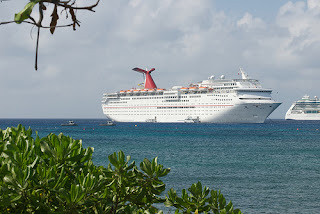 Grand Cayman is one of the three islands in the Cayman Islands other than Cayman Brac and Little Cayman. In here many tourist attractions are offered, ranging from beautiful beach, water sport, diving, night life, culinary until shopping. Not surprisingly, the island became a place most visited by tourists, as well as most offer a variety of tourist attractions. What activities can be done? Let's start from George Town. The city became a kind of capital of Grand Cayman. The most exciting of George Town is, all the stores here free of customs duty, so the items sold here are certainly cheap and affordable tourist wallets. Please visit the Duty Free and De Caymania Sunglasses Man & De Watch Man. Having tired of shopping, can careless at Tortuga Duty-Free Liquors & Bakery. It is a lot bakery sells cakes with rum. 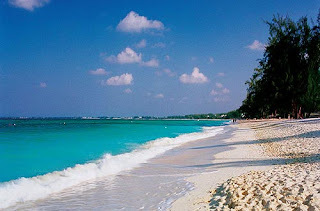 After that, get the feet to feel the coast is known as the "Best beach in the Caribbean", which is Seven Mile Beach. Like the Kuta Beach in Bali, Seven Mile Beach is a beach where the gathering of a majority of tourists who come to Grand Cayman. Magnetism of this beach is located on the white sand beach and the seawater is greenish blue. Like the ants that follow the sweet aroma, then along the Seven Mile Beach is also strewn restaurant open until the night was over. Those who love the nightlife, the restaurants can try the class at the Hyatt Regency or Weston Casuarina. But who wants to feel the pulse of the city and the beach tonight, can choose the "folk restaurants" such as Copper Falls Steakhouse or the Reef Grill. For tourists who like underwater adventure, there are 250 points that can be used as a place to live their hobby. In addition to the Seven Mile Beach, there are Absolute Divers who gives the tourists the freedom to set their dive schedule. Usually they start the activity by 10 to 15 divers. There is also a Bayside Watersports, which could be a favorite spot for snorkeling and fishing. This place is known for its friendly people and ready to help the tourists if they get lost or just ask. If still not enough, there's adventure in the Cayman Delight Cruises. This place offers the best views of the coral reef seaweed is also beautiful. Tourists who tried this place will also be served with a vengeance, with food and a decent place cleaned up. For those who are avid culinary tours, there are 150 places that can be tested, from restaurant-style fine dining restaurant that provides food to small. Need to know that traditional food here mostly made of seafood and has a strong flavor with spices such as curry. However, for those who do not want to try traditional food, take it easy, because it still can find the most famous fast food brand in major cities. Of course, other than in George Town, there are some night spots scattered on Grand Cayman. Some places like the Next Level, The Matrix, and Chameleon is a nightclub that can be tested. Who want to travel to the water, please try to trip the water while waiting for dinner or sunset. Interestingly, a place of entertainment here even longer operate during weekdays. When the working day, bars and clubs close at three in the morning and is open only until midnight on Saturdays. While all clubs closed Sunday. So, are you interesting to visit Grand Cayman?